For many years, even when they were still in school, a woman with Facebook name Shirlyn Sapp had always supported her friend and lent her money in times of need. 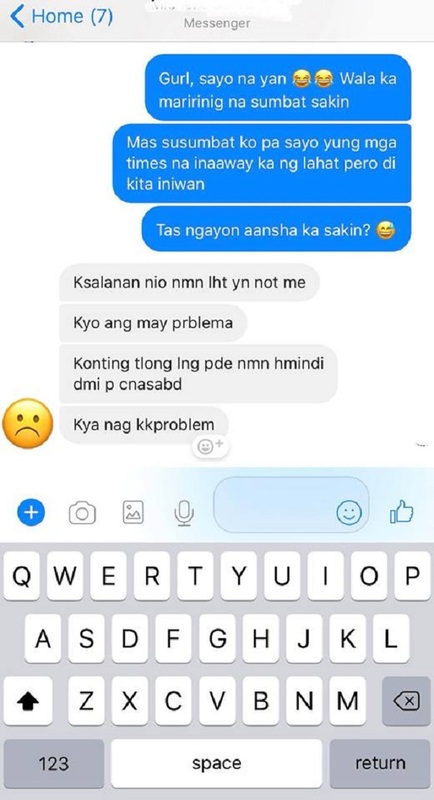 But after years of borrowing money and not even paying a single cent back, this ungrateful friend blocked her on Facebook because she wasn’t able to let the friend ‘borrow’ more money! 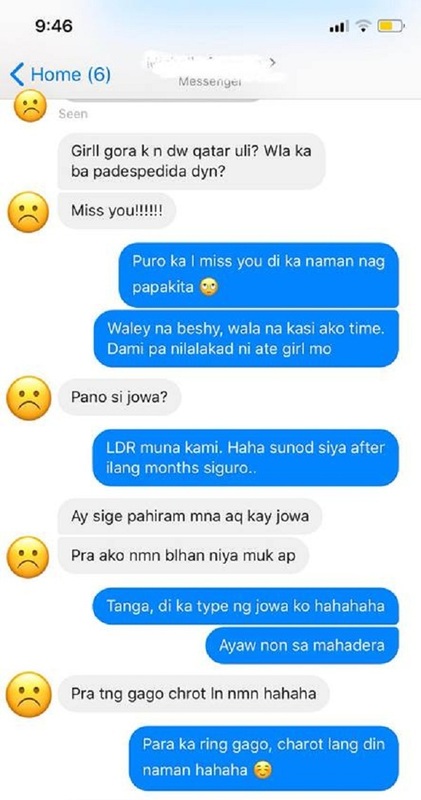 A frustrated Shirlyn shared some screenshots of past conversations with her ungrateful bessy, revealing that she had always been there for her friend since their college days but after all the help she extended, it seems that she was still the one at fault when she couldn’t send money on this last occasion. 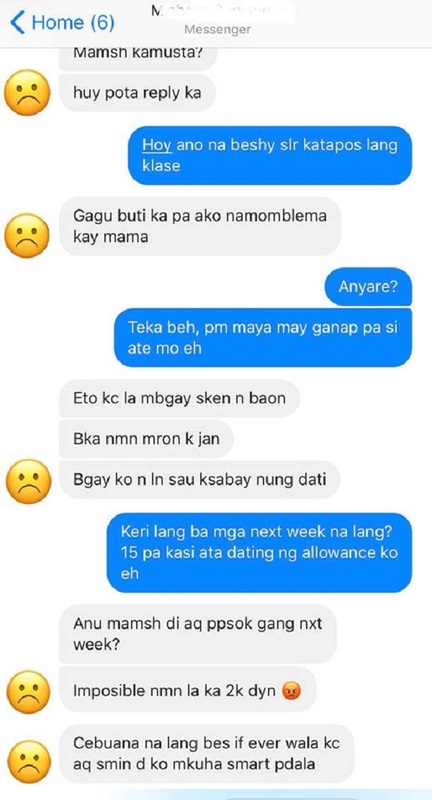 She also added that these aren’t all the screenshots of the times her bessy asked her for money but she joked that her phone would run out of memory if she screencaps everything. There were quite a number of times during their college days when the friend would message her, asking for help over various problems. 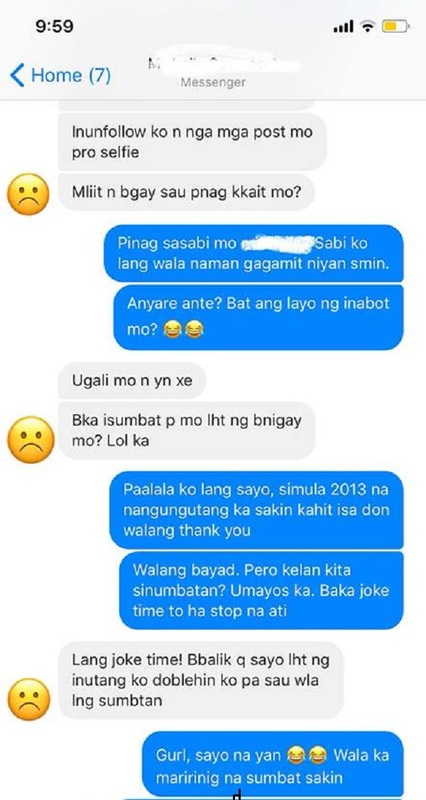 Amazingly, Shirlyn readily helped out even if the friend would borrow in thousands of pesos and wouldn’t even take ‘no’ for an answer. There were times when bessy borrows Php5,000 and wouldn’t even accept Php3,000 because she wants the full amount. 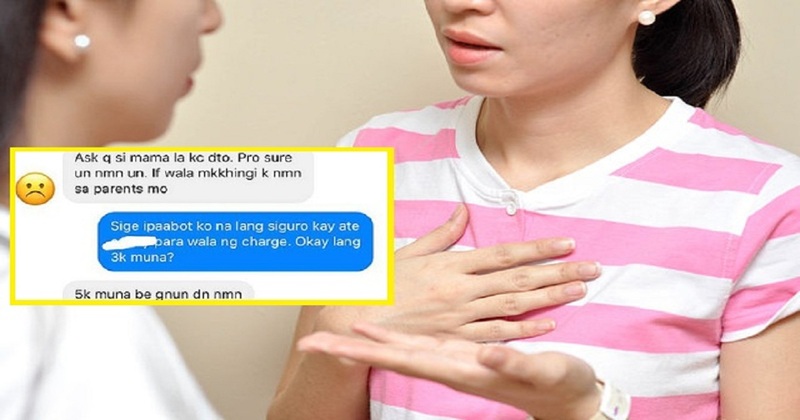 Sometimes, the friend would use her mother’s name to borrow money from Shirlyn but even in those moments, Shirlyn revealed that she never got any payment back. 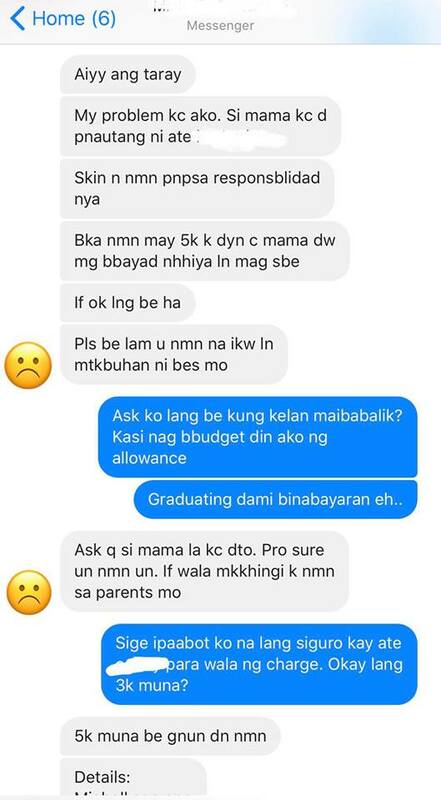 While she knows that her friend is taking advantage of her kindness, she continues to help out as she knows the latter in is dire need of financial help. But as the years passed, they saw less of each other yet the friend continued to ask help from time to time. 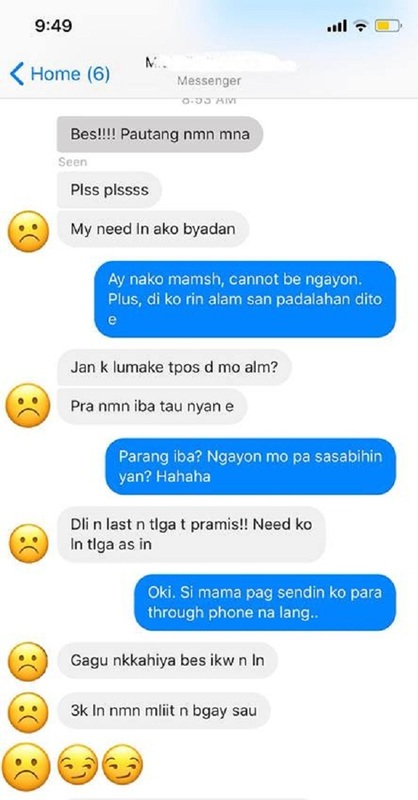 When Shirlyn worked in Qatar, bessy saw this as an added opportunity to ask for more money – and she even ‘joked’ that she wants to also borrow Shirlyn’s boyfriend so that someone would also buy her things. Crazy, right? 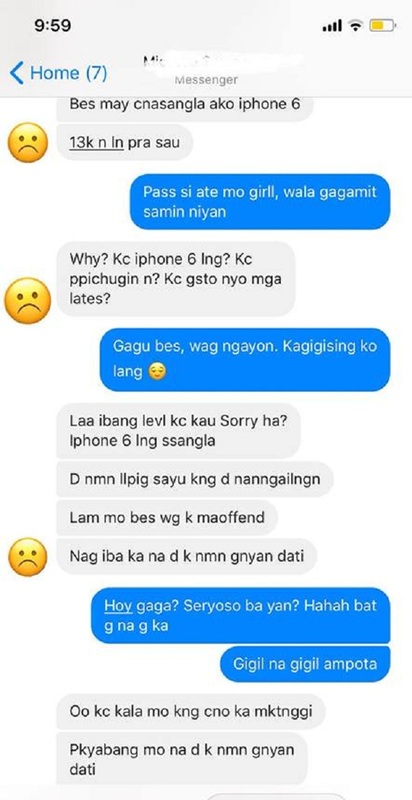 The last straw was when she tried to pawn her iPhone 6 to Shirlyn for Php13,000. When Shirlyn said she couldn’t accept the pawned item as no one will use it, the friend got mad. She said Shirlyn was becoming conceited. After launching into a tirade, even taking a shot at how Shirlyn constantly posts selfies on Facebook, bessy eventually blocked her! While it was a sad ending to their friendship (can we still really call that friendship? ), we think it’s actually good riddance!